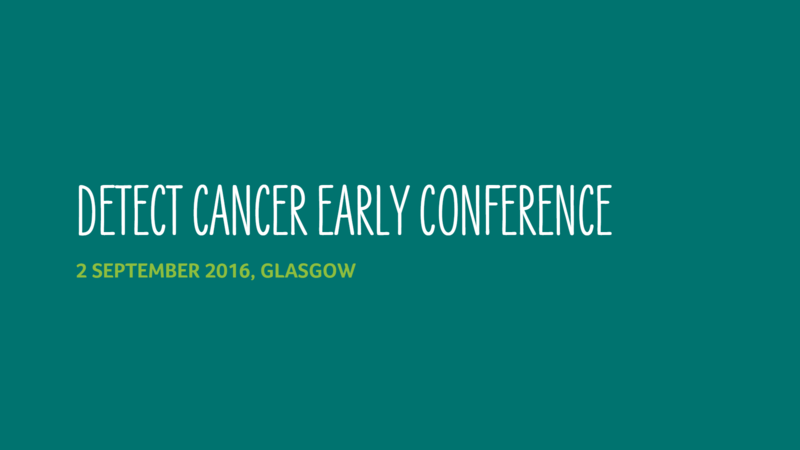 The first Detect Cancer Early (DCE) Conference will be a one day seminar, aimed at everyone with an interest in the earlier detection of cancer in Scotland. With a turning point in lifetime incidence due to an aging population, and 2016 marking the year cancer became Scotland’s biggest killer, early detection is more important than ever. Successes are everywhere across Scotland – overall survival is improving, treatments are advancing, researchers are breaking boundaries on a daily basis and even more cancers are being found early. The Detect Cancer Early Programme has played an integral role in Scotland over the last four years in a bid to save even more lives from cancer. This event will look at the progress it has made to date, share examples of good practice and look ahead to the future challenges of improving Scotland’s five year cancer survival rates.